The skier had learned basic skills on the learning slope and now was preparing to try out her first descent of a "regular" trail. But here were other skiers and snowboarders whizzing past, the snow surface was irregular with steeper places and gentler ones and there was a rolling-ness to the contours, and the run seemed so long and she was so far away from the lodge, and the slope seemed so much steeper than the learning slope ('though it wasn't), and the lift ride to get to the top of this first green run passed over a double-black slope where seemingly crazy people were bobbing up and down as they skied so fast, and one fell in that scary place! "You must make the moves you have already learned," instructed her instructor at the start of the run , "to maintain control." Instead, as she turned her skis into the fall line they--and she--shot forward, her body frozen with fear, and she failed to pressure, edge, or turn her skis in a way they could continue taking her around the turn. She instinctively leaned back, and then raced down the hill gaining speed until it was too much. Fortunately the snow was soft and she was limber. 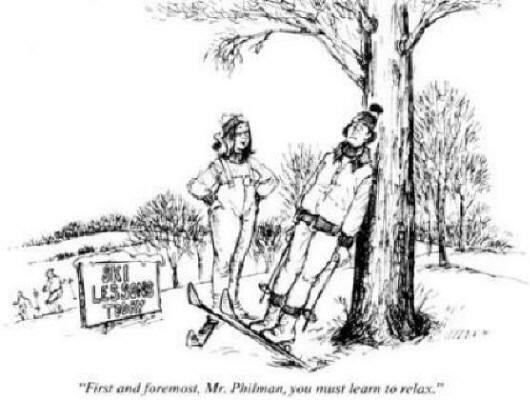 "But why," mused her instructor, did she opt to shoot 50 yards down the hill out of control and take a fall rather than moving her body forward 4 inches so she could work the skis?". Of course the instructor knew the answer, but finding what to do about it was the challenge. And why do I, mused the instructor, when on a bumpy steep that is daunting to me, move reluctantly, too? The novice skier may have good reasons to be fearful in new skiing situations. The expert skier, too, who has come upon a slope steeper, bumpier, narrower, rockier, etc., than attempted before is also likely to need to deal with the Fear Factor. Surely the most important word in Learning to Ski/Ski Better/Ski My Best is a four-letter word. No, it is not a swear word, nor is it the word "Fear". It is the word, "MOVE". To make our skis do what we want, we must move our bodies in ways that tip our skis, turn them, or pressure them and cause the skis to give us the results we desire. If we do not move our bodies so the skis get into a position that produces the outcomes we want, the skis will nevertheless be in some position and will do what they want. We communicate our intent to our skis by moving our body parts. Further, our movements must anticipate, not follow our skis. We must be proactive, although often we will also be reactive as we readjust to changing external forces. We must look ahead and say to ourselves, "I am going there," and concurrently make the moves to get the skis set up to do so. If the slope gradient increases, we must tip the body farther down the hill; if the angle decreases, we must tip it less. If we want a tighter-radius turn, we must move the body parts faster; and if a longer-radius turn is our wish, then we must move the body parts at a more deliberate pace. If we do not move, we are taken along for a ride over which gravity has control. There is a law in skiing: It is the law of gravity. We must apply it to our purposes. How can we move if we are locked with fear? Skiing involves a great deal of "headwork", that is, we have to somehow convince our brains that the ways we want to move our body parts will get the skis to work for us. The problem is that our brains have been conditioned since birth that sliding can take us where we don't want to go, tipping down hills causes us to fall, and acceleration and speed can be followed by sudden impacts. Too, moving body parts in ways that skiers do is not normal for humans, and so learned "muscle memory" kicks in and we override the proper ways to move and substitute more familiar patterns that do not work as well or at all. And that is why in learning to ski and in learning to ski better of best, we make progress in small increments as our brains learn that new patterns of movement of our body parts work better in skiing situations than old ones. The good news is that we can influence our attitudes. 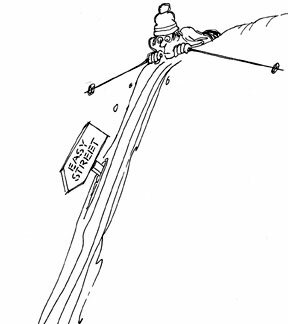 In 1983, Horst Abrams released his book Skiing Right. This book was not just about skiing technique; it was a book about use of the right side of the brain to ski well. Similar books came out in that era, too: The Inner Game of Tennis and The Inner Game of Skiing, for research had shown that the two hemispheres of the human brain perform separate functions. The right side of the brain is the rhythm or emotional side, whereas the left side is the technical or technique side. To ski, we must train both sides. Abrams presents some techniques to get the right side up to speed so it does not inhibit the left side--or is it to get the left side subdued a bit so that our right sides allow us to enjoy? One method he suggested is to pretend you are an animal that has the character you want to ski with. A fearless animal might be a lion. A graceful animal might be a bird. An animal with rhythm might be a river otter. Probably you would not want to ski like a dove or an ant or a clam! 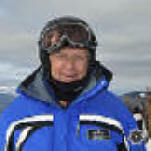 This author recalls a bump-skiing clinic in which the clinic leader would pause at the top of a double-black diamond bump run, scout out a line, and then raise his hands and ski poles into a position as though gripped on handlebars of a Harley-Davidson motorcycle, begin twisting his wrists as though accelerating its motor, then pumping one ski up and down while saying, "Rmmm, Rmmm, Rmmm" and then dashing off into bumpland. He was psyching himself up. And he was an expert bump skier. Another skier came to be known as "The Growler" as he mastered his bump technique, audibly growling at each bump he was to turn around. In fact, that was me! Once a 10-year old boy was seen negotiating a bumpfield, talking to each bump as he turned, "I think I'll turn here", "Now I'll turn around you., "Oh, here's a big one--up and over, now down and around", etc. as his father followed, shaking his head, saying, "He talks all the time!" Shouting or calling out words at turn initiation can help some, using words such as "Commit", "Move", "Pole", "Go", "Turn now!" Or shout internally. An instructor teaching bumps had 3 in the small class. Two were burly American men, and one a delicate English lady. The instructor told them to touch their poles to a bump with each turn, shout "Pole" as they did so, and then turn around the bump and pole. The word would serve as a timing device and get them to keep moving, essential in a bumpfield. The refined English lady could not be so forceful, however, so came up with her own phrase: "Nice spot! ", "Nice spot! ", "Nice spot! ", she called out as she went through the moguls and was soon out-performing her macho classmates. Some women sing as they ski; if you choose this, pick a tune appropriate to the task--probably not a lullaby if skiing bumps. One time in his early skiing career, this website author was faced with the task of skiing along a large snow-covered log. But partway through the task, he lost his resolve and crashed. Yet it would have been so simple to continue had he had commitment. And there have been many times since then t hat fear has leapt into his skiing and caused undesired results. Overcoming fear in skiing may be good preparation for life in general, for there are many instances in human activities where a positive approach is required, like standing in front of an audience or sticking up for a principle, for instance. Think of The Power of Positive Thinking by Norman Vincent Peale. Certainly, dealing with fear in skiing is not unique in the sports world: think of gymnasts, swimming divers, SCUBA divers and snorkelers, surfers, windsurfers, hang gliders, sky divers and BASE jumpers. A catcher staring down a baseball coming at high speed past a batter takes resolve to stay without flinching, as does vaulting over a high pole, climbing a rock wall, facing down the slope of a huge wave, and many more. An expression is "Fake it in order to make it." Avoid trying new maneuvers in difficult situations of slope or traffic, for fear is almost surely to kick in. In fact, in such situations, for safety, it is better to use what you know will work. Put off learning and practicing new stuff until your environment is more comfortable. The rule is "Learn new skills on old terrain; Use old skills on new terrain." It is not only skiers who must "bite the bullet" and conquer fear in order to succeed, but the same is true in many aspects of most lives. If we do manage our fear in skiing, that learning can serve us well in other endeavors. An example from a monkey tribe helps illustrate this need in another species. High in the trees of Costa Rica a monkey tribe was traveling with much chatter when they came to a break in the canopy of branches over a canal. There was one spot about a hundred feet in the air above the canal where the branches on either side came within about 30 feet of each other. We watched the ensuing scene from a boat below, totally engrossed for some 20 minutes. One by one the monkeys ran out to the ends of the branches on their side and then leapt through the air, arms and legs exten ded, falling as they flew but catching the branches on the opposite side. But one young monkey would run to the spot of leaping, then flinch and stop, running back into the treetop, crying loudly. Monkeys on the other side of the gap now chattered, as if saying, "Come on, you can do it!" and "Come on, you must do it." And indeed the young monkey had to do it, for some of the tribe were beginning to move on, and he had not yet learned to manage on his own. Still, the young one would repeat the attempt--running out to the end of branches but not completing the leap. He must leap. With one last rush toward the gap, he jumped across and landed safely in the tree branches, chattering with success, having conquered fear. 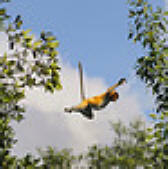 And then all the monkeys moved on through the tree tops. 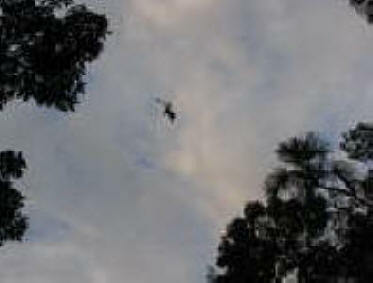 On the right is a blurry picture of one of those "flying" monkeys a long way between trees and high over the canal. Is skiing unsafe? How unsafe? 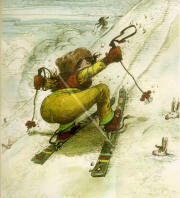 The sport of skiing is known for its dangers. Of course skiers do get injured. But how does the number of skiing injuries compare with those from other sports? It would be useful to know the number of participants in each of these activities to get an idea of the relative injury rate, but the data does show that skiing is not the only winter sports activity with hazard, nor the one that has produced the most injuries. We know of many injuries from other sports not listed, too, such as bicycling, kayaking and white-water rafting, and the team sports as well. There are some 30 million skiers in America. Has it gotten a worse reputation than it deserves? "To do it seems impossible," Nelson Mandella is said to have said, "until it is done." "How many psychologists does it take to change a light bulb? ", was asked. "Psychologists can't change the bulb," was the answer, "the bulb must change itself." Ski instructors can't change their students either, but like psychologists, they can help if allowed. This "Fear in Skiing" page last modified 11/03/2017 07:21:40 AM. Did you come here from a link on another website? For latest version of this page, copy to your browser: http://www.SkiMyBest.com/skifear.htm. Copyright © 2013, 2014, 2015, 2016, 2017, 2018, 2019. William R Jones.